Unmanned marine vehicles can be defined as robotic systems that can be operated both below and above the water surface without any human operator. These vehicles can range from very small vessels to mid-sized ships or small submarines. They are equipped with several sensors in order to record environment-related data and determine the vehicle course and response. These vehicles are remotely operated and are deployed in areas that are not reachable for humans. The information received by these vehicles is managed centrally. The unmanned marine vehicle market has witnessed significant growth over the last two decades. These vehicles have a wide range of applications including oceanographic survey, hydrographic survey, environmental monitoring, marine security, underwater photography, marine patrolling, and other applications in sectors such as defense, commercial, and scientific research. In Antarctica, unmanned marine vehicles are used for underwater topographic surveys conducted to collect information about oceans. For instance, Israel used USVs (unmanned surface vehicles) to patrol its maritime border with the Gaza Strip, while the U.S. Navy would be using USVs to work with the Littoral Combat Ship (LCS). A growing number of nations in Europe are also experimenting with unmanned surface vehicles. Moreover, unmanned marine vehicles can be equipped with echo sounders, cameras, LiDAR, sensors, visual systems, sonars, marine radars, X-band, and other payloads. These payloads can be used to classify a wide range of chemicals in seawater and examine undersea cables. All these factors are anticipated to augment the demand for unmanned marine vehicles during the forecast period. According to statistics, there has been a significant increase in search volume of unmanned marine vehicles over the last few years. The number of searches by unmanned surface vehicles increased from 2,064 average searches per month in 2015 to 3,250 average searches per month in 2018, an increase of 64% in three years. 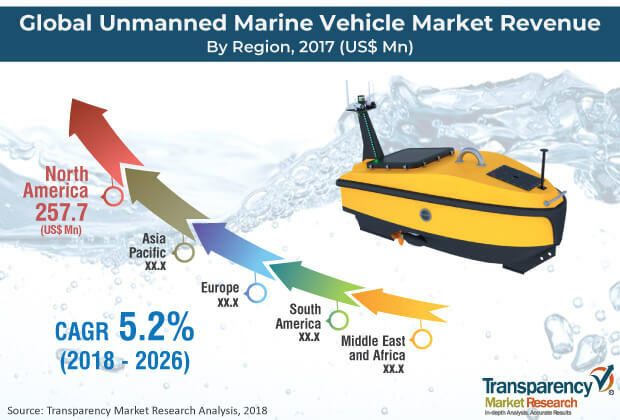 This shows the developing interest in unmanned marine vehicles among users, which is anticipated to augment the unmanned marine vehicle market in the near future. Furthermore, growing number of geoscience applications has become a major trend in the global unmanned marine vehicle market. It is also anticipated to create new opportunities for the global market during the forecast period. Unmanned underwater vehicles (UUVs) are being deployed in a wide variety of marine geoscience studies, primarily focused on seafloor mapping, but, more recently, expanding in oceanographic measurements and some other geochemical processes. Also, hydrographic surveying companies are deploying a large number of USVs for their surveys. This is projected to fuel the global unmanned marine vehicle market from 2018 to 2026. On the other hand, the remote control range of underwater vehicles is limited and their manufacturing and maintenance costs are relatively high. These are certain drawbacks in the design of unmanned marine vehicles. These factors are likely to hamper the global unmanned marine vehicle market during the forecast period. With the objective of business expansion, several players are expanding their offerings through strategic mergers and acquisitions as well as partnerships. Some of the prominent players operating in the global unmanned marine vehicle market are BaltRobotics, Boeing, Deep Ocean Engineering, ECA GROUP, EvoLogics GmbH, General Dynamics Mission Systems, Inc., L3 ASV, Oceanalpha Co., Ltd., Subsea Tech, and Teledyne Marine. This comprehensive report by Transparency Market Research analyzes and forecasts the unmanned marine vehicle market at the global and regional levels. The report provides analysis of the market for the period from 2016 to 2026, wherein 2018–2026 is the forecast period and 2017 is the base year. An in-depth and unbiased market assessment has been made to provide readers with comprehensive and accurate analysis. The report emphasizes all major trends anticipated in the unmanned marine vehicle market from 2018 to 2026. It also focuses on market drivers, restraining factors, and opportunities in the global unmanned marine vehicle market. The study provides a complete perspective on growth of the unmanned marine vehicle market, in terms of value (in US$ Mn), across various geographies including North America, Europe, Asia Pacific, Middle East & Africa (MEA), and South America. The report includes detailed value chain analysis, which provides an extensive view of the global unmanned marine vehicle market. The Porter’s Five Forces analysis provided in the report helps understand the competition scenario of the market. The study incorporates market attractiveness analysis, wherein type and application segments have been benchmarked based on their market size, growth rate, and attractiveness. In order to offer complete analysis of the competition scenario of the unmanned marine vehicle market, attractiveness analysis of the market in every region has been provided in the report. The market overview chapter explains market trends and dynamics that include drivers, restraining factors, and the current and future opportunities for the global unmanned marine vehicle market. Market outlook analysis has also been provided in the report. Additionally, the report provides analysis of different business strategies being adopted by leading players operating in the global unmanned marine vehicle market. The market introduction chapter helps in getting an idea of different trends prevalent in the global market. The report further highlights the competition scenario in the global unmanned marine vehicle market, thereby ranking all major players according to their geographic presence and key recent developments. Insights into the market is a result of extensive primary interviews, secondary research, and in-house expert panel reviews. Market estimates have been analyzed by considering the impact of different economic, political, social, legal, and technological factors. Primary research involves telephonic interviews, e-mail interactions, and face-to-face interviews for detailed and unbiased reviews of the unmanned marine vehicle market across geographies. Primary interviews are usually conducted on an ongoing basis with market experts and participants in order to obtain the latest market insights and validate the existing data and analysis. Primary interviews offer new information on important factors such as market trends, market size, competition landscape, and growth trends. These factors help validate and strengthen secondary research findings. Moreover, the data collected from secondary and primary research is discussed and examined by TMR’s expert panel. The research study includes profiles of leading companies operating in the global unmanned marine vehicle market. Market players have been profiled in terms of attributes such as company overview, financial overview, business strategies, and recent developments. Key players profiled in the report are BaltRobotics, Boeing, Deep Ocean Engineering, ECA GROUP, EvoLogics GmbH, General Dynamics Mission Systems, Inc., L3 ASV, Oceanalpha Co., Ltd., Subsea Tech, and Teledyne Marine. Companies are focusing on expanding their business through strategic acquisitions and partnerships.